Opening on August 26, 2010 and running to January 2, 2011. 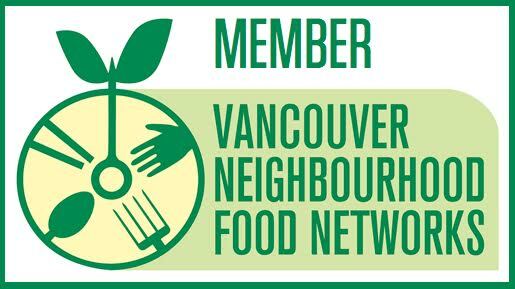 The Museum of Vancouver (MOV) has partnered with Farm Folk City Folk to explore Vancouver’s passion for backyard farming and local food. The large-scale photographic exhibit captures the current momentum behind local food production and urban agriculture. The exhibit Home Grown: Local Sustainable Food, is a visual feast of 39 Brian Harris photographs set across four seasons. Using large-scale photographs Home Grown introduces visitors to the people behind local food. The photos range from proud inner city gardeners to an aerial view of an industrial scale sustainable hothouse. Visitors will gain insight into alternate styles of growing food like house-lot farming and farming co-ops. The exhibit will also include a Communal Wall of Preserves which will grow with public participation, as MOV hopes patrons will donate jars of home-preserved fruits and vegetables. Jars of all shapes with a maximum height of 11inches or 28cm can be dropped off at the Museum’s front desk. MOV will host a series of food-based events throughout the fall, including a Free Outdoor Summer Film, a Food and Beers speaker series, Family Workshops, and Talks and Tours. Presented by Potluck Café and Catering and Horizon Distributors. Attention all foodies! Roll out a blanket and enjoy Eat Drink. k Man Woman, a food-themed movie on a giant outdoor screen in Vanier Park, just behind MOV. Free event. Presented by MOV and Farm Folk City Folk. 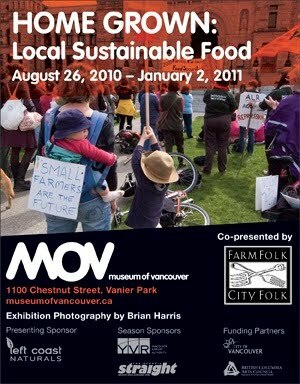 Join us to celebrate the launch of the new feature exhibition Home Grown: Local Sustainable Food. Event is open to the public. Tickets are $15 and available at museumofvancouver.ca or at the door. Can The City Feed Itself? A panel of local food corporate knights from growers & chefs to manufacturers discuss what still needs to be done to ensure a sustainable local food industry in Vancouver. Renowned authors of The 100 Mile Diet, James McKinnon and Alisa Smith, return from their travels to share ten local food ideas being trialed in other North American cities. Meet Vancouver’s food writers as they discuss the current passion for food writing and how urban kitchens are linking their food to the planet. Talks and Tours with Growers, Activists, and Chefs Hosted by Farm Folk City Folk. Held the first Thursday of the month at 7pm. Free with admission. September 2 – Chris Bodnar, Glen Valley Organic Farm Cooperative. Topic: A farmer’s direct relationship with his customer through CSA, farmers markets & restaurant delivery. 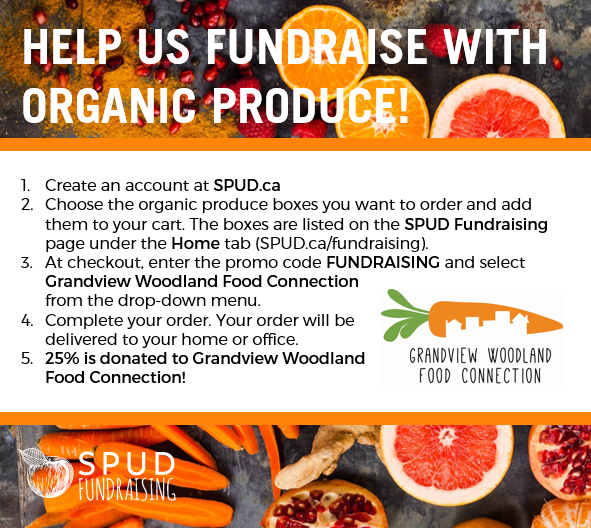 October 7 – Karen Howbolt, Salt Spring Seeds and The Haliburton Community Organic Farm Society. Topic: The politics of seeds and our local food system with a global view. November 4 – Chris Hergesheimer, The Flour Peddler with Jim Grieshaber-Otto, Cedar Isle Farm. Topic: Growing local grain and the first grain CSA in the Lower Mainland. December 2 – Chef Andrea Carlson, Bishops with Heather Pritchard, Glorious Organics Farmer. Topic: Co-creation of our local food cuisine. For the first weekend of October, MOV will open its doors to families to take part in family workshops. Please visit http://www.museumofvancouver.ca for updates and additional events.